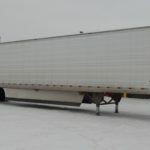 Composite Dry Van Trailer - Kingpin Trailers LTD.
Side Sheets 0.25″ Composite panel with prepainted white, High tensile galvanized steel inner and outer sheets. Side Stiffeners 19GA High tensile galvanized steel on 48″ centers. Roof Bows 16GA Galvanized steel, anti-snag, on 24″ centers. Front Wall Four hi-tensile, hat shaped, posts securely fastened with 6 heavy-duty fasteners and reinforced with a special angle clip, welded to the upper coupler and covered with 0.050 aluminum front sheets. 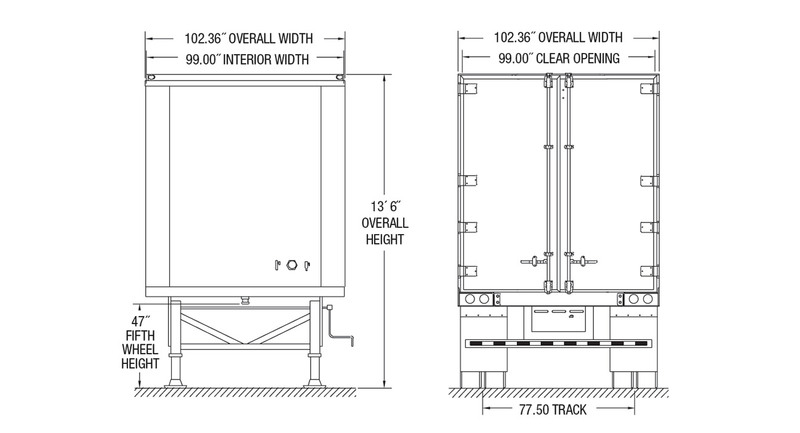 Rear Frame Hot-dip galvanized, hi-tensile steel construction 3/16″ thick with low profile header, tube shaped posts. Forged steel angle irons in top corners for added rack resistance. Lights recessed in rear sill with heavy-duty protection bars. Rear Doors Composite panel, swing door. Interior Lining Exterior grade 50″ plywood installed on bottom and 0.25″ plywood installed on top over front wall, none on sidewalls. Crossmembers Four inch deep, hot rolled steel I-beam, 80,000 psi yield strength, located on 12″ centers. Upper Coupler A.A.R. rated king pin, 3-3/8″ deep. Floor Laminated Oak 1-3/8″ nominal thickness with three screws per floorboard. Hub & Drums Ten stud, hub piloted with outboard mounted brake drums. 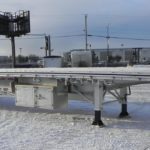 The Translead offers a reliable corrosion package for additional protection for steel components that are not part of the standard hot-dip galvanized package. HT TuffCoat® is a spray on-corrosion preventative coating for components that are unable to be hot-dip galvanized. 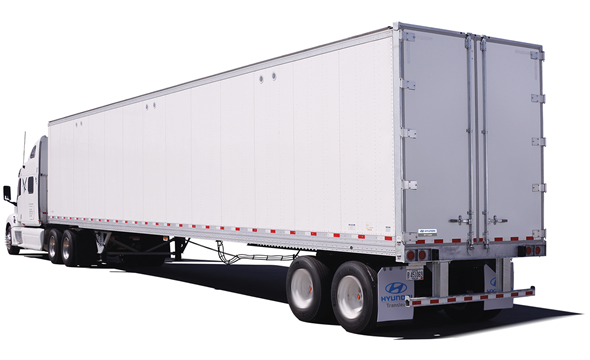 The Hyundai Translead features aerodynamic components from various manufactures to keep your transports road safe. Roll Up Doors are available from various manufacturers. Lift gates are able to be factor installed for your convenience. PSI systems are available for factory installation. Kemlite® ETR roof skins provide greater interior visibility and safety for workers as well as cargo. Dome lamps offer increased visibility and are available from various manufacturers. Wide based tires guarantee road safety and are available for your convenience.